In a memo sent to the County Council last week, County Executive Ike Leggett said he intends to pursue a public-private partnership (P3) to administer the county’s stormwater management program. That decision is particularly interesting given the facts that the State of Maryland has alleged that the county committed numerous violations of its stormwater permit and the county agreed to a consent decree in January. The potential P3 and the consent decree relate to the county’s responsibilities under its Municipal Separate Storm Sewer System (MS4) Permit, which is a state and federal mandate on large jurisdictions to undertake stormwater projects designed to improve the Chesapeake Bay. Under the latest permit issued by the state for the period of 2010 through 2015, the county is responsible for assessing sources of pollutants in runoff, identifying best management practices in stormwater control, establishing and inspecting management systems to control runoff and restoring twenty percent of its impervious surface area that has not already been managed. The principal source of the county’s funding for stormwater activities is its Water Quality Protection Charge, established in 2002, which is levied on property tax bills. The charge, which is not subject to the county’s charter limit on property taxes, has increased by more than 1100% over the last fifteen years. While the charge is intended to be used for stormwater projects, it is in fact used for a lot more than that. In FY18 (estimated), more money from the Water Quality Protection Fund went to the operating budget ($26.8 million) and a transfer to the rest of the general fund ($1.6 million) than to the capital budget ($5.4 million) and debt service on capital projects ($6.1 million). And so most of the proceeds from the charge do not actually go directly into physical stormwater capital projects. During the 2010-2015 permit period, a series of lawsuits were brought against the MS4 permits issued to several counties, including Montgomery. The end result in Montgomery’s case was a consent decree agreed to by the county and the state in January. (The state’s website does not list any other county as having a consent decree.) 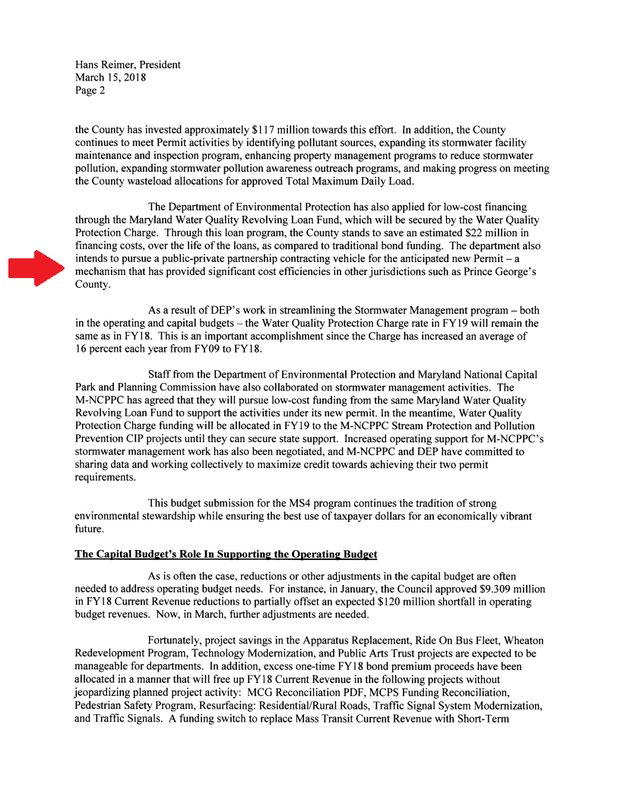 According to the consent decree, the Maryland Department of the Environment alleged numerous violations of the MS4 permit by the county, including running up deficits of unrestored impervious land of 2,004 acres in FY15 and 1,860.5 acres in FY16 as well as many reporting failures. The consent decree requires the county to build a number of supplemental environmental projects, which are not listed in the decree itself, by 12/31/20. 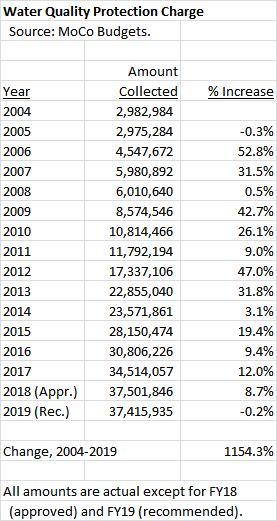 Here is a question: with the water quality protection charge almost tripling between 2010 and 2015, why was the county deficient in restoring thousands of acres as it was supposed to do under its stormwater permit? 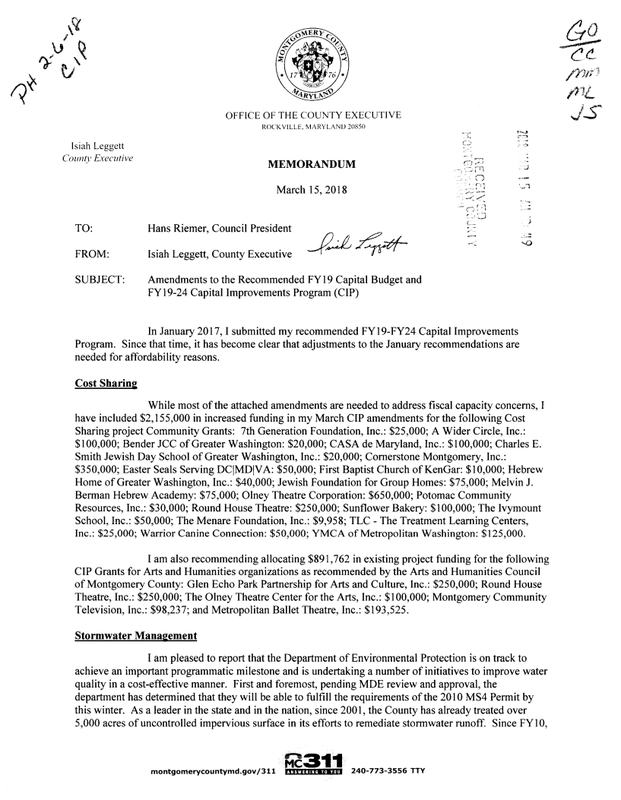 Perhaps in connection with all of the above, County Executive Ike Leggett told the County Council in a memo last week the following: “The department [of Environmental Protection] also intends to pursue a public-private partnership contracting vehicle for the anticipated new Permit – a mechanism that has provided significant cost efficiencies in other jurisdictions such as Prince George’s County.” The memo is 99 pages long, but we reprint pages one and two, which contain the reference to the P3, below. This raises a number of questions. What will the scope of the P3 be? Will the P3 be subject to open bidding or will it be a sole-source contract? How will the concessionaire be compensated? How will the county oversee the concessionaire’s operations? To the extent that they are affected by the P3, what recourse will property owners have in dealing with the concessionaire’s decisions? (This is not an academic question given the activities of the Purple Line’s P3 concessionaire.) Since the county faces legal liability to the state in connection with the consent decree, is it wise to vest compliance in a private entity? Would that entity agree to indemnify the county if it fails to achieve the mandates in the consent decree? As for the “significant cost efficiencies” claimed in Prince George’s County, their P3 is only three years old and was described as the first of its kind when it was signed. Does that P3 have enough of a track record to make it a model for MoCo? Another question. Environmental regulation is a core function of government. Selling alcohol is not. How on Earth does it make sense that a county would socialize alcohol sales and privatize environmental protection? Finally, here is the biggest question of all: why now? The current County Executive has less than nine months left in his time in office. A P3 is a major structural change to the county’s operations and the one in Prince George’s has a thirty-year duration. Is this an issue for the next Executive and council to decide? Or should they and their successors be bound by an administration with only a short time left in office? It’s time for a public discussion of the county’s stormwater performance issues and the appropriateness of a P3. We ask the County Council to raise it during the discussions of Leggett’s last budget in the coming weeks.